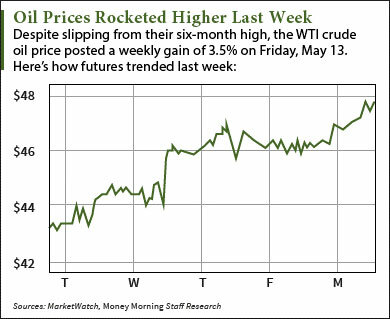 The biggest shorter of the WTI crude oil price in the world is actually the reason oil prices are rallying today (Monday, May 16). You see, a new oil price prediction from Goldman Sachs Group Inc. (NYSE: GS) has prices soaring. At 12:35 p.m., the WTI crude oil price was up 3.2% to $47.68 a barrel. The U.S. benchmark is on track for its highest close since last November. Futures for June delivery are now up 3.8% so far this month. The Brent crude oil price also posted gains in midday trading. The global benchmark added 2.7% to trade at $49.10 a barrel. Futures for July delivery have gained 3.6% in May. The biggest reason for today's crude oil price rally is Goldman's new report that the supply glut is starting to recede. Thanks to the supply disruptions from Canada's wildfires and Nigeria's militant attacks on pipelines, Goldman says global supply is quickly turning to a deficit. Roughly 800,000 barrels of production per day have been shut down in Canada, while Nigeria's daily output has declined by nearly 40% to 1.4 million barrels. Goldman's bullish oil report comes as a shock to investors everywhere. After all, the investment bank has long been considered Wall Street's biggest oil bear and originally forecast a WTI crude oil price of $35 by the second quarter. Now, the Goldman Sachs oil prediction for Q2 is $45. You shouldn't buy into Goldman's new prediction because the bank isn't just the largest oil price shorter in the world. It's also the largest oil price manipulator in the world. You see, up until today, the Goldman Sachs oil predictions were purposefully bearish. Back in December, the bank gave a 2016 oil price forecast of just $20. That's the average oil price U.S. producers need to break even. When Goldman publicly predicts crude oil will fall to $20 a barrel, it persuades everyday investors to sell their futures contracts. After all, many think banks genuinely have their investors' interests in mind. But this is nothing but a way for Goldman bankers to fill their own pockets. This oil price manipulation eventually boosts the bank's short positions and makes the firm a ton of money. "A main culprit behind the decline in WTI crude oil prices is Goldman Sachs, which constantly talks down the price of oil for its own gain," Moors – a veteran of the oil market who's advised U.S. energy agencies for more than four decades – said last September. "These price forecasts are nowhere near objective, given that Goldman Sachs has shorted oil the most out of anyone in the market." Last month, Goldman admitted to selling fraudulent mortgage-backed securities (MBSs) for its own profit from 2005 to 2007. This practice was one of the biggest causes of the housing market collapse in 2008, which led to the global financial crisis. Goldman had to pay $5.1 billion to the federal government for the malpractice. Despite the bearish Goldman oil predictions, Moors thinks the WTI crude oil price has finally stabilized in its current mid-$40 range. That means the U.S. benchmark has nowhere to go but up in 2016. Stay tuned to Money Morning for our latest Brent and WTI crude oil price forecasts. Follow us on Twitter and like us on Facebook.